programs made U.S. News' 2013 list! We have another exciting piece of Peirce news to share! 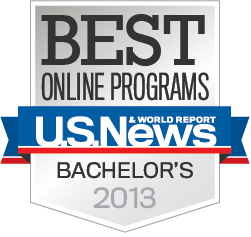 U.S. News & World Report ranked Peirce College on its 2013 Best Online Bachelor's Programs Rankings. Among the schools ranked, our online bachelor's degree program is second-best in Pennsylvania. Our inclusion on this list speaks to the strength of our online degree programs. We were among the first to pilot online classes in 1999 and began offering degree programs in 2000. When creating these programs, it was imperative that our online offerings had the same rigor and robustness of our face-to-face programs. For more than a decade, we've continued to hold to our standards of offering affordable, quality online education. I want to thank everyone who helped make this possible. Thanks to our wonderful faculty and staff for helping us innovate our programs to meet student needs so we can support them in their online education endeavors. Our students also deserve a round of applause for all of their hard work and dedication to earning their college degrees, as well as the invaluable feedback they've given us to help us continually improve our offerings. For the full list of rankings and the methodology for how the rankings were created, visit U.S. News & World Report's website.